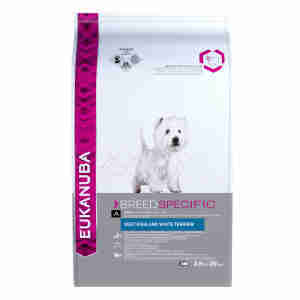 Eukanuba Breed Specific Adult West Highland White Terrier Retriever (Chicken) is recommended for adult West Highland White Terrier’s 1+ years. It is a complete and balanced daily food made with high quality animal based protein, designed to help promote healthy skin, help manage weight, promote digestive health and help maintain strong and healthy teeth. Healthy Weight: Reduced fat* to help maintain optimal body weight (*vs. Eukanuba Adult Small Breed). Optimal Digestion +: Higher level of Prebiotics* to help promote digestive health (*vs. Eukanuba Adult Small Breed). I have tried many foods for my two westies, 1 of which has an awful skin condition. I tried this after a friend recommended it and it's brilliant. Her skin look so much better and I'll definitely be keeping her on this.